5 Best Drones For Fishing [SEPTEMBER 2017] Long Range and Reliable ! Fisherman, here’s list of 5 drones that can be extremely useful for fishing ! More and more fishermen are looking for new, innovative ways to increase their catch. It’s a tough competition out there and each new idea goes though many trials and errors before being considered as an efficient new method. The same goes for drones. Since drone for fishing is definitely great idea in theory, it’s worth testing it in practice. Fishermen have several uses for them and, believe it or not, they are actually pretty good at efficiently improving the rate of caught fish. Some people use them for scouting the surrounding area and looking for fish nearby, while others mount entire fishing lines and use them as a complex fishing mechanisms. Now, if you are a fisherman and you would like to improve your work efficiency, it might be a good idea to take a closer look at some of the fishing drones described below. All of them have long operating ranges which makes them perfect for exploring the surrounding water surfaces. In addition to that, some of them can carry quite a lot of payload as well, making them ideal for mounting swivels, fishing lines and pretty much the entire mechanisms needed for fishing. Whichever fishing with drones method you’d like to try out, one thing is certain – these drones can help you out big time! Flying a drone in commercial purposes requires you to have a FAA Drone Pilot License. Getting one is easy task if you follow our : FAA Part 107 Study Guide. How to use a drone for fishing? 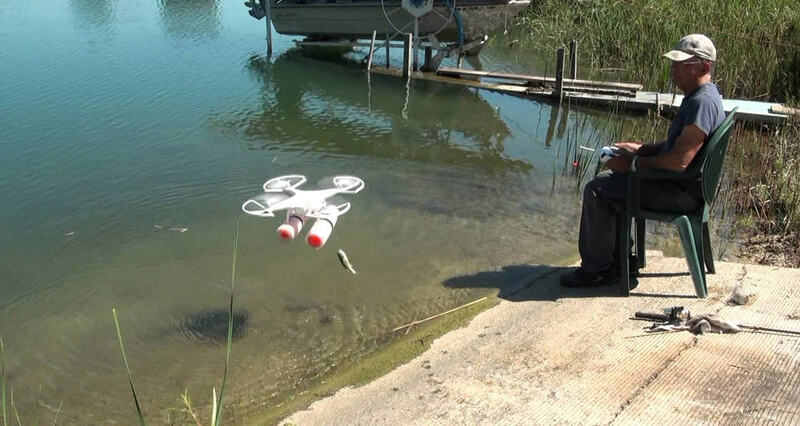 There are two main ways of fishing with a drone. The first way is very basic. Simply attach the string along with a bait and hook and hover your drone at a certain location above a water surface such as a lake, river or an ocean. Sooner or later a fish is going to take the bait and you’ll end up with a sweet catch. Unfortunately, this method is risky and could end up with you losing your drone forever. You see, if you stumble upon a giant fish, it will easily pull your drone into the water… and you don’t want that, do you?! That’s why there’s a second method, a more sophisticated one. This method doesn’t put all the stress on your drone. Nope. Here, drone will only serve as a guide for your string, allowing you to fish in deep waters without needing a kayak. But, it requires some tampering around with the drone and a very special accessory which I like to call downrigger clip. This little mechanism will hold your fishing line and let your drone take it away to your desired location. Once a fish gets caught, it will provide enough tension which will result in this clip releasing the line straight into the water. Now, your drone is completely free (if you’re drone fishing alone this would be the perfect time for activating the One Key Return To Home feature) and the rest of the work is solely up to you. How to choose a fishing drone? As I’ve mentioned above, the perfect fishing drone needs to have excellent battery and stable hovering function that will keep it steady in midair for longer periods of time. Besides that, you also have to make sure your drone has a rigid spot on the frame that’s suitable for mounting that downrigger clip I’ve mentioned above. The best option is to mount this little thing on the landing gear of your drone. It’s the safest and the most secured spot. You can be sure your little mechanism will not go anywhere once you’ve attached the downrigger clip to its legs. That’s pretty much it when it comes to choosing a fishing drone. It’s not nuclear science, choosing a drone is the least of your worries… getting everything else properly set is the key for your little fishing adventure to have a successful outcome. What are the benefits of drone fishing? The main (and the obvious) benefit is clearly getting your fishing line to waters that are way beyond reach, without using a kayak. As you can probably tell on your own, this is really helpful to people who don’t own kayaks at all and are generally only fishing next to the coastline. For these people, drone fishing might drastically improve yields and provide them with a hi-tech aerial support unlike any other. On the other hand, if you already use a fishing kayak, then I suppose there’s no need for specialized drones. True, they make fishing a lot more fun but, with the presence of a fishing kayak they’re not that needed anyway. Make sure your drone can take enough payload. 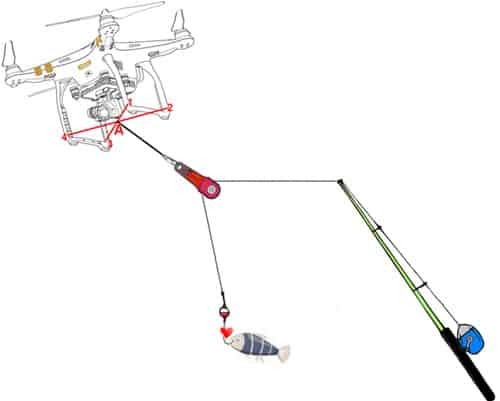 Keep in mind that you’ll be attaching not only the downrigger clip but also a good portion of your fishing line as well as your hooks, baits and all that… If the drone you bought doesn’t have powerful motors that can handle that sort of payloads, you will not be able to use it for fishing. Pay attention to wind speeds. If you’re living in a windy area and you’re planning to go drone fishing, make sure you’re not putting your drone against the windy weather. Steady hovering will not function properly if it’s too windy so you might end up losing your drone. 3DR solo is an excellent drone with lots of useful features. Its biggest virtue is of course its specs sheet which shows quite the numbers for a relatively small price tag to its name. It boasts with roughly 22 minutes of flight time which is more than enough to scout around your fishing boat looking for nearby groups of fish. Add that up with cca 800 meters of seamless operating range and it becomes clear that 3DR solo makes up for a great scouting drone. As a fisherman, you can use its smart flight modes to set up autonomous flight or waypoints around your current fishing route (other drones on this list have these functions too) . This way, the drone can give you a rough outline of the terrain around you, allowing you to plan ahead. Fishing with drones is easier with smart drone, and 3DR Solo is definitely one of the most advanced affordable drones out there. Upair One is a great drone for fishing which can serve fishermen in many ways. With its firm landing gear, you are able to easily attach fishing line, swivel and the complete fishing mechanism to it. Plus, the 3-axis camera gimbal will allow you to fluently rotate the camera to your desired position, making it much easier for you to catch fish from a huge distance and those hard to reach places. 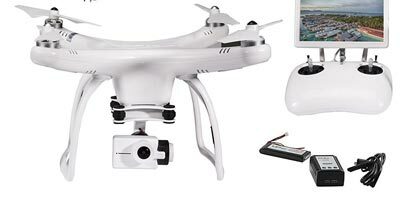 In addition to that, Upair One is also a good scouting drone as well, just like the 3DR Solo. With 0.5 kilometer of flight range and an excellent 4K camera, it can definitely give you a sharp mapping of the surrounding area. Moreover, it has a pretty powerful battery too. This 5400mAh LiPo battery charges up for roughly one and a half hour and can last up to 20 minutes on a single charge. Control range is 500 meters. And lastly, you should definitely check out the controller of this little fella. It sports a clean, glossy white design (very minimalistic, sort of like those default controllers of DJI phantom 2 and 3) and features a huge 7-inch display. It will definitely provide as a good display for FPV purposes and will give you a clearer perspective on the nearby fish. We all know DJI. They are the most popular drone manufacturer out there. They pretty much single handedly raised the idea of drones and made them into a worldwide phenomenon. But why is their Phantom 4 Pro so good for fishing? Well, let’s just say that it’s probably the BEST fishing drone out there (toe to toe with Inspire 2 actually) due to its incredible operating range. Believe it or not, this beast of a drone can reach up to 6 kilometers away from its transmitter without even breaking a sweat. This is DJI’s newest technology that they implemented into their newest series of drones, the Phantom 4, Mavic Pro and Inspire 2 (we’ll discuss about this one later on). In addition to its awesome range that will give you plenty of scouting space, since it’s average flight time is 25-27 minutes. Phantom 4 Pro also comes with a state-of-the-art camera. Not only is it able to record in 4K resolution but it is also mounted on the well-known DJI’s gimbal stabilization system. This makes for a shake-free experience without any stuttering in videos or blurry images. The build quality is nothing short of perfect, but that’s something we are already used to from DJI’s drones. All things considered, it’s pretty clear that there aren’t many better drones out there on the market than the outstanding Phantom 4 Pro! If we’re going to talk about outstanding fishing drones, then this one should be our main topic. It is not surprising to see a great drone made by Yuneec. 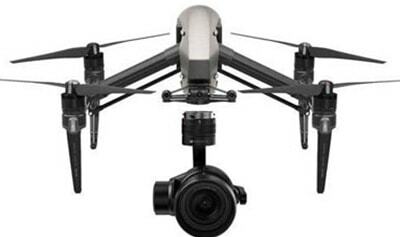 As a matter of fact, it’s quite a common occurrence since Yuneec is standing extraordinarily on the drones’ market. With their Q500 stirring up quite the fuss when it was first released, their Typhoon H model looks to do the same. It’s a powerful hexacopter that can lift medium to big game with ease. All you need to do is attach the fishing mechanism (you can find plenty of tutorials online) and you are good to go. In addition to outright fishing, Typhoon H can also serve as an excellent scouting drone. With its GCO3 4K camera mounted on a continuously rotating 3-axis gimbal, it can definitely provide you with a crystal-clear image of the surrounding scenery. You’ll assess that on the 4.3-inch display which is located on its dedicated controller which is, truth be told, quite sturdy and good in hands. Responsiveness is another virtue too; Typhoon H is very agile for such a huge drone. Its speed will definitely hit you with surprise. Flight time of this drones is somewhere around 20-25 minutes per battery, while control range is 1000 meters. And, last but not least, I’d like to mention a special feature of this beast – collision avoidance (DJI Phantom 4 Pro and Inspire 2 have this function too). Even though it might not be the most suitable thing for fishermen (except if you’re fishing in a narrow river filled with trees, branches and whatnot), it will still come in handy more often than not. If we take everything mentioned about Typhoon H into consideration, we will end up with a pretty good sum of all its worth, making it an amazing all-around drone suitable for both casuals and professionals. 1. DJI Inspire 2 —> Very expensive. Finally, we have reached the final and best drone for fishing on our list. 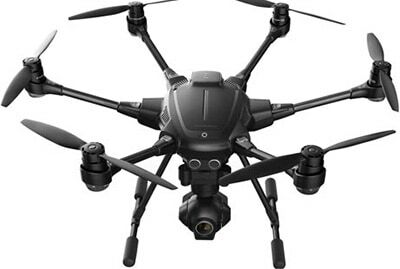 It’s the amazing new Inspire 2 by DJI. You probably already heard about this drone. It’s basically the pinnacle of DJI’s technology. Every single part of their manufacturing system was tested to the limits while producing this badass looking drone. Needless to say, they’ve left no one disappointed. This amazing drone has everything it needs, and not just for fishing but for virtually any type of scenario you put it up against. You want it to be a scouting drone? That’s no problem! With 6 kilometers of seamless range and approximately half an hour of juice per battery, you cannot find a more optimized drone. You want a professional platform for aerial photography? That’s no problem either! With its 4K camera and a state-of-the-art Zenmuse X5S gimbal, you can expect professional quality aerial photos and videos. You want it to be a fishing drone? NO FREAKING PROBLEM! Even if you attach 2 mechanisms to Inspire 2, it still won’t feel a thing… It’s just too damn powerful. There, I’ve said it all… I rest my case… Will someone please buy DJI Inspire 2 for me so I can test it out a couple of days and then die a happy man! Now that you know a bit more about the 5 best drones suitable for fishing, it is time to say a couple of summarizing words before ending this article. First of all, I would like to express my gratitude for taking your time to read through this list. Second, if you are a fisherman who wants to improve its efficiency by investing in a drone, then I really hope this list helped you in any way possible. That’s one of the reasons I made it in the first place – to make your life easier. 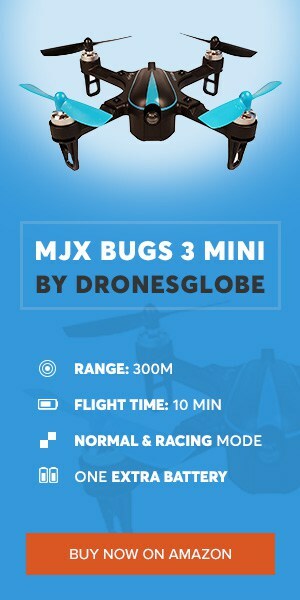 I know for a fact that drones can be really confusing to regular Joes who aren’t exactly the biggest tech addicts, which is why I made this entire website, to help you guys with picking out the right one. It can be a rather time consuming task, but with the help of my lists, it’s definitely much easier! Now you’re officially one step closer to fishing with drones! Until next time, good luck fishing! Flybrix: Can This Mini Lego Drone Kit For Kids Really Teach Them How To Build Drones? Can't believe you left out the SplashDrone with the payload options to carry your lure/bait to the fish! And waterproof - I think the only one on the market with all the features of the DJI etc. drones. surprised to find that you didn't cover splash drone fisherman which is specially designed for surf fishing bait dropping.